Joining the generational war, on the same side as everyone else. A continuation. This exactly like Pataki school funding. A huge increase in funding outside NYC, a cut in funding for NYC, but the promise of state debt for school rehabilitation. In the end the money was not borrowed. I repeat: who’s running against Cuomo in the Democratic Primary next time? I voted for Zephyr Teachout last time and she did quite well for a candidate with no funding and no institutional support. Next time Cuomo should go DOWN. Assuming we have a candidate, that is. I’m afraid I can’t run; my family has forbidden me to. One thing that really should be considered is having the governor elected in presidential election years when turnout is better. It usually results in saner candidates, or at least more sunlight on them. This year there would at least be the possibility of a Zephyr Teachout-figure riding Bernie Sanders’ coattails. Even if Sanders doesn’t win the primary, he clearly attracts voters who are much less likely to be pro-Cuomo. Next year? Fatigue with Hillary Clinton is likely to be setting in. There you have it. I assume that goes for state legislature too. And I assume that isn’t just you. The PTB are well aware of this. Ben, you’ve probably covered this elsewhere, but I haven’t found it yet. I’ve been wondering how the MTA is able to be the debt machine that allows the NYS government to avoid balancing its budget every year as most states must. How is the MTA allowed to borrow so much money – does it have a limit? And is there a limit on what the funds may be used for (i.e. for non-MTA projects)? AFAIK, no state is required to balance its budget unless it chooses to pass a law to that effect. To get around this, the state will use public authorities because they can issue bonds. There are procedures for doing that and they have to get approval for a lot of them — for the bigger ones certainly — but it’s a lot easier for public authorities to do it. All states except Vermont have a balanced budget requirement–some are statutory, some are in state constitutions. More detail here. 3. The 90% absolutely need more transit infrastructure. 4. The 10% really do not need more roads and bridges. 5. But in order to get the funding for 90%, an equal amount has to be spent on the 10%. 6. Because the state is contributing the money, our limo passenger Governor in Albany decides which projects get built – none of which ameliorate the root problems in the system that affect passengers on a daily basis – but sound “world class” and “iconic,” like a Penn station with more retail and a mysterious LGA train that takes longer to get to the airport than a bus and costs the same as a taxi. 7. The state will not actually be contributing any money. 8. The L train needs to be shut down for 2-3 years. More like two-thirds. But a much lower share of the older, native born people who actually vote. And within downstate the suburbs matter more than the city, which is full of young adults and immigrants used as cash cows. More like one-third, and a higher share of voters as mentioned. But thanks to Generation Greed can’t even afford to maintain what they have. Plus thanks to the contractors new transit infrastructure costs more there than anywhere else. But thanks to Generation Greed can’t really afford to maintain what they have. And Upstate also spends more on road maintenance than anywhere else, because those who do it are richer than the rest of the locals. Part of what I call the white welfare system. Again two thirds and one third. The one third get cash. The two thirds get debt. Don’t forget there are roads downstate, and transit upstate. We aren’t sure what the $22 billion for “Upstate Roads” includes. The state is agreeing to have the MTA borrow the money. It isn’t just the Governor. It is the state legislature, which is far worse than the Governor. The legislature represents people who are already dead or retired and moved away. Cuomo put up a little actual money recently. There had been no state money for decades before that. Just more debt. So they are saying to con people until being grateful when it shut down for 12 months. What’s so bad about issuing debt for transit projects? Interest rates are still near zero, and increased construction spending without higher tax revenue would be a short term boon to the state economy at a time when wage growth is still tepid. If the projects are valuable to New York’s long term growth, that in itself can, in the long term, reduce debt-to-gdp. Seems like Cuomo’s putting some Keynesian strategies back into action. Nothing if you’ve a plan to pay it back. Plus it’s debatable whether most of his new projects are very valuable. In my personal life, I haven’t run up my credit cards to live large. But unfortunately I share of city/state/country with predators and suckers who put out nonsense like this. Younger generations have been robbed, robbed, robbed. I objected BEFORE the consequences starting coming due. It is now after. Very little of the MTA capital plan provides any long term growth to pay back debt. It is mostly maintenance to prevent the state’s long term collapse. Maintenance that will eventually come to an end due to all the debt. Upstate, it’s mostly welfare. There is nothing wrong with using debt to fund system expansions. But the MTA already plans to borrow $billions for those over and about the $8 billion. And that’s with phase II of the Second Avenue Subway cancelled. How soon are you moving to Florida. Phase II of the Second Avenue Subway is not canceled. Their in the design phase. As soon as they are ready for construction Cuomo agreed to allow them to add those costs to the capital plan. Meaning they will issue more bonds for it. Phases II-IV will be paid for by revenue backed bonds mostly, as well as any other system expansions. As pointed out by others, debt makes sense if you are using it to generate growth. The overwhelming amount of debt being accrued in the MTA Capital plan is used to fix what already exists. This becomes problematic when all of this debt comes to bear. 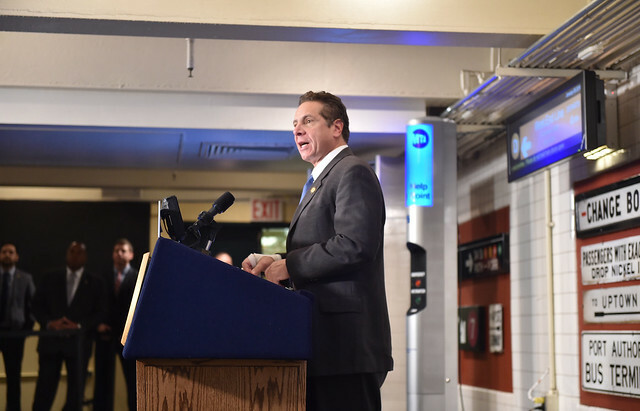 The Tri-State Transportation Campaign says that by 2030, $3.5 billion of the MTA’s operating budget will be consumed by debt. There is no anticipation that $3.5 Billion in additional revenue is being generated by these projects. This only gets worse if the MTA continues to have to issue bonds for significant chunks of the capital program. So what do people want to borrow to force younger generations, who are poorer, to become worse off to pay for? No “debt scolds” among the Republican candidates for President. They’re all debt scolds. The more they scold, the more it frees them to deficit spend for the things they like (like tax cuts for their privileged buddies). There’s no such thing as generation greed. Issuing debt has been a part of capitalism from DAY ONE, and it will be a part of capitalism long after everyone alive is DEAD and GONE?. I’m a contrarian, so I view this as good news to get the ball rolling, at least. Nothing real is going to change until the old suburban voters upstate die out. Once the center of political power and money is focused on Manhattan, there will be a new golden age of transit. The trend has been a return to the cities, and at some point in the future the balance will be tipped from appeasement of the rural upstate and urban NYC. One of the indicators I look at is the population growth of NYC compared to the rest of the state. NYC is currently growing faster. This trend needs to continue and NYC residents need to vote. The city is already king for high paying jobs. No one is moving to Buffalo for the big money. Are you suggesting that eventually NYC will do to them what they did to NYC when NYC was down, and now? I don’t think most NYC residents will support that. And in any event, by the time it becomes possible it will be a different “them” up there than the people who screwed us. “They” will be gone to Florida or the grave. I’m confused. How is what I said inconsistent with that statement? Upstate v. Downstate dichotomy is a probably oversimplified. Buffalo, Rochester, Syracuse, and Albany are big enough and dense enough, or could be, to warrant modern transit investment of the sort (if not scope) that NYC needs. At least light rail, if not heavy rail. Cuomo, of course, has no interest in letting them reverse their decline, much less helping them. Buffalo has light rail. Wikipedia says it carries 13,900 passengers a day. Have you ever been north of 96th Street? There is no congestion upstate and almost everybody owns a car. Have you ever been north of Tampa? Your attitude is exactly why Upstate cities are in seemingly perpetual decline. Besides that comment about congestion just not being true in larger upstate cities, they are largely empty urban shells with basically walkable urban space. Transit is not a backup plan when too many suburbanites want to drive. It must be useful for its own sake. Lots of people live in those empty shells. It’s not my fault that women stopped having 4 kids a piece. Or that people are making enough money to have an apartment of their own without 3 roommates. It’s not an attitude it’s observed reality. Why would someone who owns a car, won’t get stuck in traffic and can find plenty of free parking take the bus? Even the people who live in the older dense walkable neighborhoods own cars. Because they might even be able to live without their cars, saving themselves thousands$ a year? The observed reality in Upstate cities is population decline and economic stagnation. Upstate suburbs actually aren’t much better. Upstate population isn’t declining. It’s just growing very slowly. True or not, and that’s already very bad, the biggest Upstate cities have been continually trending downward. Most American cities that aren’t gobbling up their suburbs have shrinking populations. So? There’s bus service in the dense walkable neighborhoods. I’m sure there are households that don’t have a second car because there’s a bus to get them to work. They aren’t going to give up the car because there isn’t any congestion and it easy to park anywhere they want to go. Which includes a lot of places that are never going to have bus service more often than once an hour. If that. So, it’s desirable, for them if not you, to reverse that. Reverse what? The invention of cheap automobiles? Do you seriously not pay attention to the things you write? Define “that”, whatever it is you are reversing. Cities that haven’t gobbled up their suburbs have less housing units than they had in 1950. What are you going to tear down so they have as many as they did? And where are you going to put the parking? They need more than they had in 1950 because the average household size has dropped. Unless you want to ban birth control so the average household size goes up. How about razing all the over 55 communities so grandma has to move in with the kids and grandkids? Tear down the expressways so it takes a lot longer to get in from the exurb 10 miles out from downtown? People still won’t get on the bus because the bus is stuck in the now awful traffic. Ban free parking? I know tax the gasoline so much people want to get on the bus. Which will crash the economy like it did when prices spiked in 2008 and they won’t have to get on the bus because they lost their job! Not even to go down and apply for benefits because it’s 2015 and you can do that online. What are you going to reverse? Put so much infill multifamily housing into Syracuse that the new urbanists are having orgasms there’s still not going to be enough people to have the bus run so often that people give up the first car. The buffoonish motorsexual spergout following your demand tells me you did understand what I was referring to. Pro-tip: pretending to be extra stupid usually isn’t a very good rhetorical strategy. What does birth control have to do with automobiles? Or housing density? Or deed restrictions in adult communities? “that” is rather ambiguous, define it more clearly for the rest of us who don’t have your clarity of thought, so we can better understand whatever it is you want to reverse. It was in direct response to a question you asked: “So?” I really don’t see how it could possibly be confusing for you. If the flight to suburbs wasn’t enabled by cheap automobiles what did it? You either have to increase housing units or increase household size. One of the reasons household size has shrunk is that American women don’t have as many children as their grandmothers had during the Baby Boom. It’d be hard to convince women in Bangladesh to have as many children as women in the U.S. had during the Baby Boom. I’m gonna assume banning birth control is not an option. So is making it illegal for retirees to own property forcing them to move in with the kids and grandkids. So is cratering the economy so the kids and grandkids move in with grandma. Widows have enough income that they don’t have to take in boarders and potential boarders make enough money that they can rent whole apartments. Increasing household size isn’t viable. Stuff every nook and crannie with infill housing… you aren’t going to be able to sell it or rent it unless it comes with off street parking. Or get permits to build it. The dense walkable neighborhoods that developed around the trolley lines are still dense and walkable. What are you going to do to make the people living in those dense walkable neighborhoods to give up their car? Please don’t let me interrupt your discussion with yourself. Relax. The libruls are not coming to take away your pickup track.